So, you've decided to take the plunge into a better organized lifestyle. Congratulations! The results from acting on this decision will lead to a better quality of life. We've discussed the benefits in depth of organizing your closet, including less stress, better sleep, and improved overall health in a previous article: see Closet Works Closet Blog "Reduce Stress by Organizing Your Closet". You understand the "why" — the only thing that remains is "how." There are several steps to achieving a perfectly organized closet. Follow these tips to get your perfect closet like the ones offered by professional custom closet companies. Par down and eliminate the clothes that don't fit, you no longer need, or haven't worn in a long time. If you are hesitant to get rid of things because you think you have worn them and might need them again, try the backwards hanger trick promoted by Oprah Winfrey in her home organizing tips and discussed in our article How to Clear Your Old Closet Clutter & Make Room for New Purchases. It is a good way to figure out what you need and what you can safely get rid of. Take inventory and measure everything that is left and needs to go into your closet. You will get a much better result if you plan ahead. You can use the form on this page to help you in measuring all your clothes. How to measure separates: Hang all your separates together for measuring the total amount of space needed. If in a current double hang or single rod section, measure in between panels or walls and get the total LINEAR INCHES of clothing. How to measure medium hang and long hang: Medium hang clothing includes dresses to the knee and trousers for both men and women. Long hang includes any garment mid-calf to floor. Again, measure the LINEAR INCHES of all the clothing. Also measure top of hanger to bottom of garment to get the length needed for both medium and long hang sections. Count your pairs of footwear and the number of accessories like belts, ties and scarves. Count your stacks of folded items — a typical stack is 12"W x 12"H.
How many purses and hats? Shelf space will need to be reserved. Count any specialty items in order to allocate appropriate space for your storage needs. Separates should go into a double hang section. If your closet doesn't currently have double hang, make one. You will get twice as much storage space using this technique. Closets with a single clothes rod will need to move that rod up to accommodate the second rod. Mount the top rod at 81-3/4 inches, the lower at 40-1/2 inches. Medium hang clothes go into their own section with shelves above. Use the length you previously measured to determine the height of the clothes rod, leaving a few inches of clearance at the bottom. Shelving for hats, purses and shoes can be included above and/or below. Long hang clothes are usually by themselves on a single rod. Depending on your height, you may have room for a couple of shelves above or below. Organize your clothes by color. Typically, you want to arrange your clothes light to dark, but it also depends on frequency of use. You want the clothes you wear most frequently to be in the front. Then arrange the colors so that they go together with the colors next to them. Shelves work best for shoes: Women's shoes should be spaced 6 to 7 inches apart; each pair needs at least 7 inches of shelf space. If you have a lot of shoes, you may want to consider a rotating shoe rack for the corner of the closet that will hold up to 200 pairs of shoes. Allow 40" x 40" inches of space in a corner if you decide to go this route. Closet shelves can store many folded items rather than drawers. Shelves are less expensive than drawers and are easy to move around as needs change. Shelves for folded clothing should be placed about 12 inches apart. Closet drawers are a good organizer for lingerie and small items. Banks of drawers in the closet can get expensive, but the cost will be offset by reducing or eliminating the need for separate pieces of furniture like dressers and chests of drawers elsewhere in the room. Depending on the quality of your bedroom set, switching to a custom closet with drawers may even save money. Use closet accessories like shelf dividers and drawer dividers to help keep everything tidy and make it easy to put things away. Make sure your hangers match. No matter how well you plan and organize your closet, it will look like a mess if all your hangers are different styles, colors and materials. Invest in a good set of functional hangers as the icing on the cake to your newly organized space. Getting and staying organized is hard work. The potential benefits, however, are huge. If you follow these tips, you can achieve organizational bliss in no time at all, creating a relaxing atmosphere that will positively effect your own life, rubbing off on your friends and family alike. Closet Works is Chicagolands' largest and most experienced provider of custom storage solutions. Since 1987, we have been helping homeowners by creating custom closets, pantries, bookcases and more to help organize their lives. 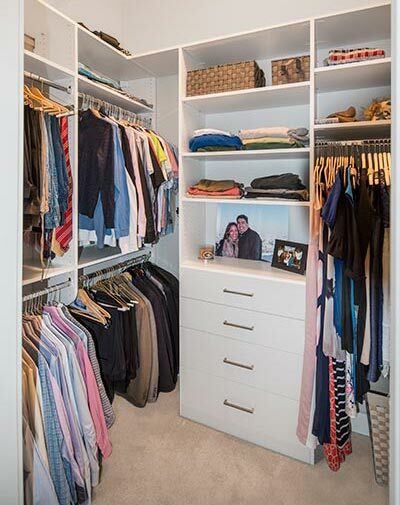 Examples of our custom closet solutions can be found throughout our website. For more information on Closet Works call toll-free at 800-4-CLOSET (800-425-6738). Closet Works Wardrobe Inventory Checksheet. Click on the infographic to view it larger. Typical medium hang section with sweater shelves and cabinet above. Closet with double hang, long hang and section with shelves and drawers.